It was an eye-opener to chat with Dr. Carla Marie Manly, a practicing psychologist and the author of ‘Joy from Fear: Create the Life of Your Dreams by Making Fear Your Friend.’ Her book tackles the issue of fear head-on, and encourages us to take another look at what we’re afraid of and why we’re afraid. There are two kinds of fear, according to Dr. Manly: destructive fear and constructive fear. In constructive fear we’ll find the key to our own growth, transformation, and happiness. It’s the kind of fear we shouldn’t fear. I spent my first four decades on the planet living for others—doing what a “good” daughter, wife, and woman should do. To the outside world, I “had it all” as a successful businesswoman, parent, and wife, but the image was a shell. At age forty, I had an epiphany that sent me back to my original calling—the world of clinical psychology. My marriage ended soon after, and my world turned upside down. The journey—as a single mother with two boisterous teenage sons—was deeply challenging and filled with loss, but I grew and expanded wildly. I gained more in self-awareness and self-esteem in the next ten years than I’d found in the prior forty years altogether. In the course of my doctoral program, I wanted to explore what had held me back for forty years—and discovered it was fear. I became fascinated with the topic of fear and began to investigate it. That investigation turned into my doctoral dissertation—a qualitative and quantitative analysis of what I came to term “transformational fear.” In this research, the 700-plus participants’ information allowed me to see that fear affects us both positively and negatively, and that, indeed, many people are held back in life by the destructive side of fear. I learned, too, that one side of fear—its constructive side—is often ignored and unseen. In the end, it became clear that constructive fear is the key to a well-lived life, a life that is positive and fulfilling. 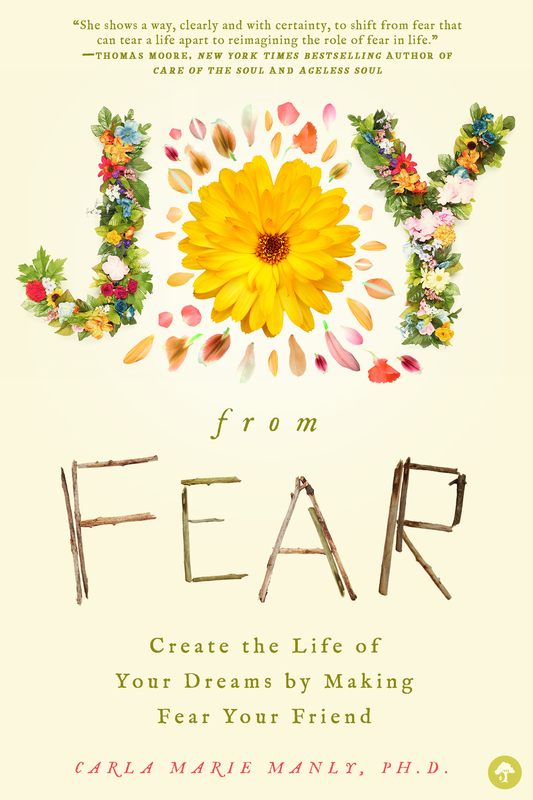 Joy from Fear contains some of the theories and results of my research, yet it goes beyond to help guide readers into finding the lives of their dreams through the process of embracing fear. My goal? To help others get unstuck, as I did—so that they, too, can live with passion and joy. As a working therapist, how do you approach to patients suffering from fearful memories and long-held fears? My work as a clinical psychologist takes me into my clients’ innermost worlds. Each fearful memory is a key to a certain lock. As we address each fearful memory, we delve into the root causes of their fears. For some clients, this work is rather swift. For others with deep, long-held fears, the exploration can be slow and delicate in nature. In the end, emotionally invested clients with a curious, willing attitude make the most progress. I work with each client on a very individual basis. With some, talk therapy—Jungian-based—is ideal. For others, a blend of CBT (cognitive behavioral therapy) is best. I also use EMDR (eye movement desensitization and reprocessing) for certain clients. I’ll often assign “homework,”whether journaling or other specific exercises, to help clients make the most of their journey. Can you explain the different kinds of fears? Why do some fears have such a powerful, paralyzing grip on our bodies? Our deepest fears can actually impact us physiologically. Even if they are irrational fears, the fearful mind and body often does not differentiate between a real threat and an imagined threat. When the mind detects a threat, the brain reacts VERY quickly to move into a “fight-flight-freeze-appease” mode. This happens instantaneously and on a very primitive level—without thought of how rational the response might or might not be. Example: You are about to board a plane after hearing a news report about a horrific plane crash. All of a sudden, your body is racked with chills, you can’t breathe well, and your heart is racing. You feel paralyzed and claustrophobic, unable to move into the boarding line. You now feel flushed, panicked, powerless, and out-of-control, whereas moments before you were fine. This is fear at work, creating a paralyzing grip on the body through the powers of the mind. Some of the early exercises in your book focus on just experiencing a feeling and not really doing anything about it. Why is this step so important? All too often, we are not in touch with our feelings. Men, in particular, are raised in a fashion that disconnects them from their world of emotions. Given that our emotions feed and affect our thought processes, our emotions are a vital source of information. When we slow down to experience a feeling—to just get to know it without having to judge it—we learn about our own feelings and our physical responses to them. Given that we are often judged (in childhood and adulthood) for “feeling our feelings” or “showing our feelings,” these exercises allow for exploration and acceptance of unexplored, unknown parts of the self. How can your book help people who are suffering from PTSD? PTSD is more common than many people realize. I hope that my book helps open the door to a greater understanding and awareness of PTSD. Those who are already in treatment for PTSD could use my book to further work with a trained therapist. Those who are not in treatment—who may not even recognize that they have PTSD—could use my book to develop greater awareness of their issues and, I hope, enter therapy to fully address the address. PTSD is a painful and often debilitating condition. Like other mental health concerns, PTSD needs to be normalized, validated, and given proper attention. How does fear affect our relationships and ability to have genuine intimacy? Sadly, so many of our relationships—work, families, friendships, and romantic partnerships—are both driven by fear and riddled with fear. When it comes to our deepest relationships—often our romantic partnerships—fear certainly affects the ability to have genuine intimacy. Why is this so? Because fear breeds mistrust in the self and in others. Without trust, a basic building block of relationships, we cannot begin to form true intimacy. True intimacy requires a trusting openness—a true and respectful deep sharing—on the part of both partners. Fear, whether held within the soul and heart of one or both partners, will negatively impact intimacy and, thus, the relationship. Can you talk about the power of goal-setting in terms of personal transformation? We are so used to setting goals for issues such as losing weight, exercising, or handling work and home tasks. Sadly, we often forget that our personal transformation—the very journey of the self through life—also requires and deserves attention. For those who become interested in self-work, goal-setting becomes a vital part of the journey. Without goals, we tend to stagnate or take the path of least resistance. Goal-setting allows us to envision what we want for ourselves in the interrelated components of life (emotional, mental, physical, and spiritual). Once we reflect on what is important to us, we can then set our course in that direction. Personal transformation doesn’t “just happen”—it is accomplished through intentional steps that build on each other for a lifetime of self-growth. For more about Dr. Carla Marie Manly, visit www.drcarlamanly.com.